This is part 12 of the Freelap Friday Five Series, 2013 Edition. To review the 16 part 2012 edition, click here. If you run Masters Track, chances are you’ve heard the name Bill Collins. It’s extremely rare to see an open elite athlete to compete at the Masters level. You don’t see Carl Lewis or Michael Johnson running Masters? In 2007, Bill Collins was named "World Masters Athletics Masters Athlete of the Year" which was presented at the IAAF gala in Monaco. In 2011, he suffered paralysis to his legs, rendering him unable to walk, later diagnosed as Guillain–Barré syndrome. As inexplicable as the disease’s cause, was his recovery. After spending the 2011 season in a wheelchair, with the WMA in his “backyard” at Sacramento, in early 2012 he came back to set a new indoor world record in the M60 60m at the USA Indoor Masters Championships. Bill Collins, along with Rick Riddle, are the authors or the book The Ageless Athletic Spirit (Training With A World Champion) . Q1. This question would have been a good question before London 2012, with USA having so many problems in past WC and Olympics. You were on the 4×100 relay team that won the gold medal at the first ever 1977 IAAF World Cup, along with Steve Williams, Steve Riddick and Cliff Wiley. Back in those days, how were the relay teams chosen? How much practice did you have? Were there as many relay camps? Q2. Did you take time off from open to Masters? Can you give an idea of your training? (i.e. how much less volume and intensity as compared to an open athlete) For the 100 meters, how do you balance acceleration (start & drive phase), top end speed, and speed endurance? Bill Collins: No, I has been training and competing since 1967. Many things have changed from those days, the body has aged, the mind has much more knowledge of the sport, tracks and training equipment has improved in every aspect. As you age things change, the volume of work drops off and your intensity level in workouts are cut back, this is mainly to avoid injury and hopefully save the legs for race day. 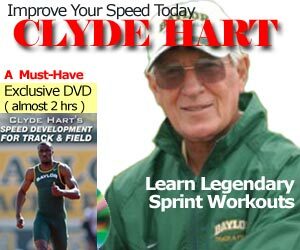 Nothing much else has changed, as for the 100 meters you still do all the same things just at a little slower rate, you still work on having a good drive phase which set up the body for acceleration phase that leads into the run. Q3. Do you believe in the attrition rate? I’ve always said for a 400 meter man, add 4 seconds to your open PR to get a M40 goal, then it’s 2 seconds every 5 years. For the 200m, add 2 seconds to your open PR to get a M40 goal, then one second every 5 years. For the 100 meters, you are looking about “half a second” every 5 years! Of course, there are some guys like James Chinn or Enrico Saraceni who break this rule. Bill Collins: You are correct as it comes to your calculation on the attrition rate, but you do have a few athletes that break those rules. It’s a great standard for the majority of athletes running today. Q4. Are starting blocks overrated for Masters? Masters athletes don’t have the same amount of strength and power as open athletes, and maybe they should be using a 3 point or 2 point start? You’ve set records using a standing start! Bill Collins: Started blocks are okay up to a point, for those 70 plus athletes I would look at going without blocks. Many of the 70 plus athletes that I work with have all gone to a standing start. Even here you will find a few athletes that will be the exception. I was able to developed a good standing start, that was due to the fact that I had pulled stomach muscle at the time and could not get down in the blocks. Without blocks for most of the younger runners, it shortens your drive phase. Bill Collins: Many of the indoor 200 meter races which were done on some of the old wood tracks. I don’t have a favored, I just enjoy the sport and all the runners that make up the masters movements One record that isn’t mentioned anymore and no team has ever ran faster which was ran at Madison Square Garden back in 1981. The "Sprint Medley" 440, 220, 220, 300 we ran a world record time of 2:00.19. I ran the 300 leg. Looking forward to getting my health back to 100% after my battle with GBS and just have fun running. We have a lot of great masters athletes running today. The 100 record in my age group as well as the 200 and 400 are very good records, by some great runners so nothing is going to be easy if those records are broken. Great and inspiring running streak Bill ! Long may you run Bill ………..
@JJ, I’ve give you my secret… stay healthy. Because if you don’t toe the line, you can’t set a record! great benefit for many of us ……….I think …….. 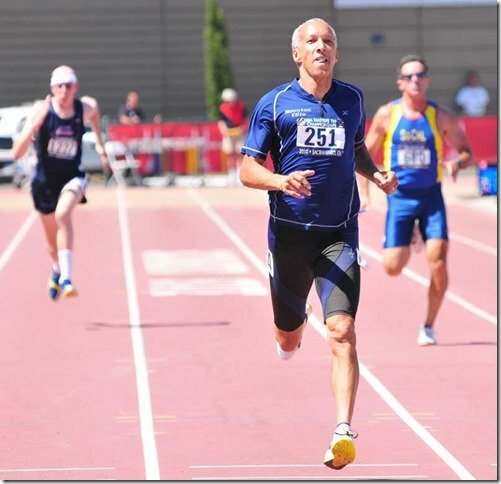 I am a novice masters “sprinter”-had never ran, took it up 3 years ago when I turned 54! I struggled with starts-tried standing but found I wobbled about and took forever to get going. Tried conventional blocks start but still horrible. Did a bit of research and found the Moye start. Found this was easy-very little weight on the arms/hands. I currently use a modified version of the Moye start-I am no expert but it has really helped me-I use conventional blocks (I bought my own to practice) each one set as flat as it will go. Then I put only the heel of each shoe on the block-the entire spike plate of both feet is on the track, this puts most of the weight on the legs. I have my left foot foward, my left hand is back several inches behind the right. I position the blocks slighly closer to the line than the “rocket start”. Once in set I concentrate on throwing my left hand forward as fast as possible with the gun. Google Moye start for a better description. What sbout training tips for masters over 70 years old? @Roberto, I can see Bill avoided the question :) (These 5 questions were prepared in advance, then sent by email, so I don’t get a chance to follow up.. at least no on this article. Maybe I can have him on SpeedEndurance TV? – yes Sir I have …. @JJ, the #1 tip is to stay injury free. Once injured, you are no use to your body. Also, injuries take way longer than young people, so your season can be over in a flash. I want to start sprinting again but have not laced up my shoes in a long time ,since 1986 many injuries from service but I will not mention them but I just completed running 5 miles for my base and know I need to know what to do—- LSD one day and sprints the next –I was very quick but not very fast –at 18 ran the 50 in 5.5 but lose speed after that ran 100 yards in 9.7 in 1976–ok I am 62 now and want to see what I can do against people here in Maine . @Bill Freeman, focus on getting fit first, before sprinting.